There are times when life gets in the way of our dreams. 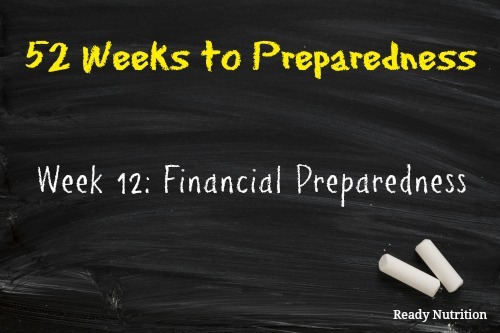 Learn ways to be financially prepared in order help out with life’s unexpected events. There was a time in the not too distant past where I was enslaved to debt. I supplemented my income with credit cards in order to maintain an overindulgent lifestyle, and when my daughter needed emergency medical care, my financial situation worsened because I didn’t have medical insurance. The medical bills were a nightmare, and paying them off seemed like a never ending uphill battle. For years we had to live below our means in order to sort out our financial mess. During this time frame, I repeatedly asked myself, “Why didn’t I set some money aside for harder times? Why didn’t I prepare for this?” It was these questions that led me on a journey of financial discovery. Instead of wallowing in self pity, I educated myself in finding practical ways to fight back and to simplify my lifestyle, which became a huge lesson in self control. 1. Counteract financial emergencies by preparing for them in advance. Even when times are financially prosperous, it is a good idea to have a financial contingency plan in place and some emergency funds set aside to fall back on; this money can act as a buffer when things do go financially awry. 2. Focus on meeting your practical needs, i.e., food, water, shelter. As long as you have shelter and food to provide for your family, you are ok. The rest of the financial mess will eventually sort itself out. 3. Stop spending frivolously. Cut the following from your budget: restaurants, manicures, and Starbucks (my sister just fainted). Set a goal to save as much money as you can. 4. Take advantage of grocery store advertisements and coupons. You can save a substantial amount of money when you search for discounted goods; throw away brand loyalty. 5. Buy products in bulk. Purchase a few extra short term food supply items (e.g., canned goods, formula, flour, sugar, etc.) each time you visit the store. Accumulating a few extra items will not break the budget, and when the money gets tight, you have the items on hand. 6. Trim the budget and shift your focus to the bare necessities. If you have children and one of the parents isn’t working, don’t spend money on daycare. If you are concerned about a lay off, start conserving your money by cutting back on energy bills, cable bills, etc. Speak with family members and let them know that you may be losing your job. Sometimes friends and family have good advice and possibly some contacts. 7. Have a garage sale to get rid of items that are no longer used. “One man’s trash is another man’s treasure.” You may be surprised at how much money you could get for your gently used items that are collecting dust in your garage. Finding ways to cut corners can be a proactive way to learn new skills. Rather than paying a company to landscape your yard or paint your home, do it yourself. The more skills you allow yourself to learn, the more self-sufficient you will become, which is the reason we are trying to become prepared. As an example, one of the ways I cut back and became more self-sufficient was to start baking my own bread and making my own condiments. If I hadn’t made the choice to be more frugal, then I never would have learned how to make fresh bread and can vegetables. Rather than purchasing emergency supplies this week, concentrate your attention on your family’s short-term and long-term financial goals and discover ways to trim your budget. 1. Create a financial contingency plan. 2. Look at your budget and begin eliminating unnecessary debt. 3. Try and save 5-10% of your paycheck to use as a back-up plan. Excellent advise. The only thing I would recommend is to consider generics and scratch cooking rather than coupons. I have found the savings substanial. Always compare the after sale/coupon price of a brand name to a generic. Often, the generic is still less. Do I still buy certain brand name items? Sure, but not many. The number of individual pantry items goes down while the flexibility of using staple items goes up when scratch cooking. For instance, rather than storing store bought bread, Biscuit or pancake mix and muffin mix type items, one would store flour, salt, baking power and baking soda which is normally kept onhand anyway. It does take time to learn how to make items from scratch, but the quality does go up in time. Also, for those concerned about preservatives, there are little to none. Cream of Tartar is a good thing to have on hand for homemade baking needs. If you run out of baking powder you can make your own using cream of tartar, baking soda and cornstarch. Also from a preparedness standpoint, i believe baking powder can go bad somewhat quickly whereas the separate ingredients have a substantially longer shelf-life. Buying generic is a great idea. Basically with over-the-counter medication, just look at the percentage of active ingredients, and if they are the same or equivalent, the generic brand is so much cheaper to buy. Good article, but it assumes that the present currency will remain intact. From the time I write this, you have a very short amount of time to examine and comprehend our currency system. Once you do, you will minimize the amount of Federal Reserve Notes (dollars) you have and transfer that wealth to other things, like your preps, but also bartering grade items like precious metals, coffee, sugar, liquor, ammo, etc. These are the things people trade with in post-economic collapses. scratch cooking sounds great, but got a big problem – I used to LOVE to “scratch cook” and was good at it. But as I’ve gotten older, seems nothing I cook anymore is worth using all the ingredients and the time!!! What happened? Just 2 of us. Its easier to put stuff in the microwave or open a can/freezer bag. Any ideas on how to my “scratch groove” back? I want to start the self-suffient trip now – retirement is on us, money will be short, stuff will be more expensive than right now, and we want to be healthy, not make the doctors richer!! Catsears – you could make a big pot of your favorite meal, allow it to cool and add smaller portions to zip loc bags, freezer proof tupperware or can them for longer term storage. Good luck with learning how to be more self reliant.